Telephone: 077 100 001 (office); 1300 (24 hr call centre). Visit the bustling port of Kotor, sitting at the end of the Kotor Bay. There's plenty to recommend this UNESCO-listed fortified old town, including its Venetian architecture, 17th-century clock tower, 12th-century Romanesque cathedral, naval museum, chic boutique hotels and seafood eateries. It's possible to charter a private yacht for the day and sail around the Bay of Kotor. Ringed by dramatic soaring mountains, this meandering bay is often described as Europe's southernmost "fjord", though it is in fact a submerged river canyon. Its shores are dotted with waterside villages made up of centuries-old stone houses and fishing harbours filled with coloured wooden boats. 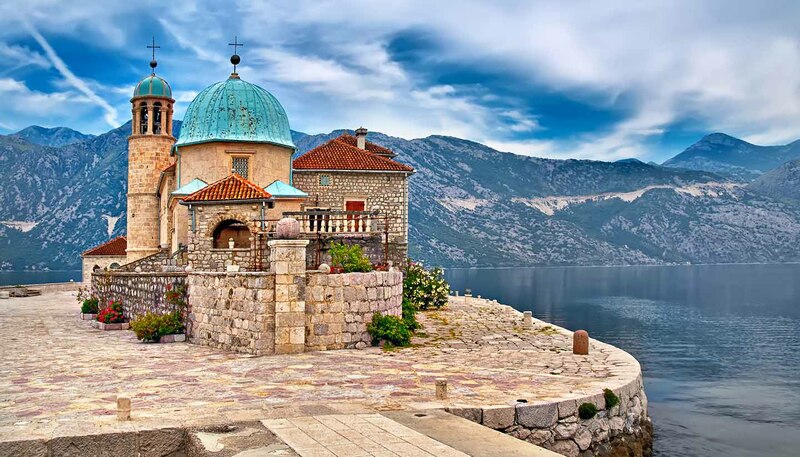 On the Bay of Kotor, Perast is made up of old stone villas, overlooking two tiny islets, Sveti Đorđe (St. George) and Gospa od Škrpjela (Our Lady of the Rocks), each capped by a church. The islets can be visited by boat from Perast's waterfront. Southeast of Budva, this medieval stone village, perched on a fortified islet, connected to the mainland by a causeway, is a luxury resort. First converted into a hotel during the Yugoslav years, when guests included Elizabeth Taylor and Richard Burton, it reopened as the 5-star Aman Sveti Stefan in 2009. A 700-year-old town with much to recommend, Herceg Novi is a must-see. Visit the fascinating baroque Savina Monastery and the beaches on Luštica peninsula, which overlook the entrance to the Bay of Kotor and are accessible by boat. Protected by medieval walls, Budva's car-free old town is made up of quaint cobbled alleys, lined by Venetian-era buildings, many now hosting restaurants, cafes and souvenir shops. East of town, Slovenska plaža is a long narrow beach overlooked by a string of big modern hotels. Hike, bike, kayak, raft or paraglide in stunning Durmitor National Park, which has been awarded UNESCO World Natural Heritage status for its glacial landscapes, high peaks, dense pine forests and some of the deepest gorges in Europe. The highlight is the Crno Jezero (Black Lake), a 3km (2-mile) walk from the national park office in Žabljak. The biggest lake in the Balkans, Lake Skadar, on the border between Montenegro and Albania, is on the Ramsar List of Wetlands and is a haven for birdwatching, hosting some 270 species, many endangered or rare. The National Park office is in Virpazar – from here you can take a boat trip across the lake, and eat fresh carp at waterside restaurants. Take a trip up the rocky mountain massif of Lovćen, towering above Kotor. Its peak, at 1,657m (5,440ft), is home to the Njegoš Mausoleum, dedicated to the Prince-Bishop and poet, Petar II Petrović-Njegoš. From here, you'll enjoy spectacular views, both inland and down onto the Bay of Kotor. The national park office is in Cetinje, which used to be home to the Montenegrin royal family and capital of Montenegro. Explore the Biogradska Gora National Park, home one of the last three jungles in Europe. The primal forest spans 5,400 hectares (13,343 acres) between the Lim and Tara Rivers. You can also find eagles inhabiting the soaring Bjelasica Mountains. The national park office is in Kolašin. Widely considered the best beach in Montenegro, Jaz, just west of Budva, is a 1.2km (0.7-mile) stretch of fine pebble beach, lined with sun beds and umbrellas, overlooking a turquoise bay. Open-air concerts are sometimes staged here – The Rolling Stones played in 2007, followed by Madonna in 2008. The highlight of inland Montenegro, at 82km (51 miles) in length and a depth of 1,300m (4,300ft), is the dramatic Tara Canyon. The deepest canyon in Europe boasts endless rapids, adventure sports such as rafting and canyoning. There's also bungee jumping and zip-lining off the Tara Bridge, a five-arch concrete road bridge with amazing views down into the canyon. The nearest towns are Kolašin and Žabljak. You'll be amazed by the 17th-century Ostrog Monastery, which is built into a vertical cliff on the road between Danilovgrad and Nikšić. Inside, in a tiny cave church, lie the remains of the founder of the monastery, St Basil of Ostrog. Montenegro's largest wine producer, Plantaže is best known for its potent red Vranac wine. Vranac means "black horse", which in the past was considered the symbol of strength and beauty, as is this wine. Visit Plantaže's Šipčanik wine cellar, between Podgorica and Lake Skadar, to taste their wines and purchase bottles to bring home. Walk around Ulcinj, one of the oldest towns on the Adriatic coast. Its top attractions include the Balsica Tower and Renaissance Church Mosque, which is also home to the City Museum. The 12km long (7-mile) Velika Plaža is a fine sandy beach, which remains largely underdeveloped and is backed by a flat hinterland.